Currently the Urban Adventure League fleet stands at five bicycles. A large number for some, though paling in comparison to others. Five is near the upper limit of comfortability for me, as I like to keep them maintained. More than that and it becomes hard. But of course, that’s not to say I wouldn’t like more bikes. There’s no big urge right now to get another bike, but that doesn’t always stop me from pursuing things I maybe shouldn’t. Last week, during the “snow events”, I found myself sans velo for a few days. Oh sure, I did still have all my five bikes, but they were at my house, and I was staying with Emee for a few days. I decided against bringing a bike with me because when I left the house on Wednesday, everything was ice and I didn’t want to drag a bike along if it was going to remain crappy. Of course, everything thawed and I traveled by foot or bike for a few days while watching bikes whiz by. So then an idea hatched: Why don’t I have a bike for Emee’s house? Just in case? I stay over at her place enough, and sometimes I might not be travelling there by radfahr. But what would this bike look like? Well, I decided to peruse Craigslist. I wanted to see if there were any cheap and decent candidates out there, something that I could get for maybe $50 to $100 and do a few simple things to like add fenders and a basket. An old mountain bike or early hybrid would be the most practical steed and also the easiest to find cheap. 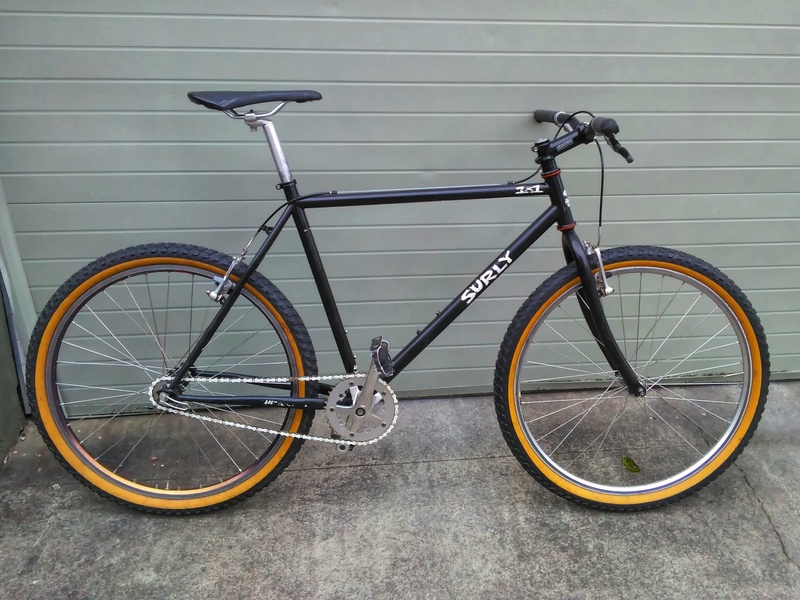 And while there were a few worthy candidates, something else caught my eye, a Surly 1 x 1. Now, a modern single-speed mountain bike was not what I was searching for, but… I could do quite a bit with it. It would be my only “true” mountain bike, as it’s an earlier version lacking silly things like fender eyelets. And it could theoretically fit pretty fat 26 inch tires, even as big as 26″ x 3.0″ on the front! It’d be sort of a fat bike. And a bike with such wide tires would be a great candidate for when it really turns winter here. And the best part: The seller wanted only $200! $200 was more than my original budget, but what the hell. I got in touch with the seller and made an appointment to see it. And of course this is when I had second thoughts. Do I really want to buy another bike? I could just get the Heavy Duti improved, as has been the plan for like a year, and leave it at Emee’s. And while $200 is not a lot for a bike like this, there’s plenty of other things I could do with that cash. For instance, both the Crested Butte and the Bantam were in the shop getting work done. The Lake Pepin Three Speed Tour was coming up fast, and I need to buy train tickets and all that. And while it might only cost $200 for the bike, what about if I need to do things to it? Anyways, I met up with the buyer and checked out the 1 x 1. It looked okay, though there were some rust spots on the frame. I took it for a spin. The cockpit felt cramped, since the bars were low and straight. Ah, mountain bikes. The brakes were Avid V-Brakes, great when they work, but these needed work. The tires were whatever Kenda. The saddle hard and plastic, the pedals plastic. What was I expecting for $200? Still, these things can be remedied. The important question was: Was I feeling it? Was the bike fun to ride? It’s hard to tell with a five minute spin ’round the block. But it wasn’t really grabbing me. And then I stopped myself. I knew myself. I’d invest easily another $200 or more into this bike changing out the bits that needed it, and then doing things like getting plus tires (not cheap) or concocting even more involving projects like building a three speed rear wheel. Then would I sell it after I invested all of that into it? I returned to the seller and told him that I wanted to think about it. He seemed genuinely surprised that I wasn’t going to buy it then-and-there. I asked if there were other people interested and he said yes. Good. I figure at that price someone would jump. And jump they obviously did, as the post was down the next day. I walked away from there, relieved. I was glad that I showed self-restraint. There will be other bikes in the future, for sure. But now wasn’t the time. And this wasn’t the only time that I almost bought a bike but stopped myself: On Christmas Eve 2010 I almost bought a battered and beaten Raleigh Lenton. So now I need to get the Heavy Duti fixed up. It will happen soon, but I definitely need to get some other stuff done first! Next postA new edition of the Cycling the Pacific Coast book is out! I think that 1×1 was cool too but, that one looks too small for you. Congrats on the self restraint. I think once the fleet gets to be a certain size it is necessary. “I decided to peruse Craigslist” is a dangerous opening line in my history of bike addiction lol Nice restraint Shawn. Such self restraint, I could feel the relief in your voice as you told him no.